When I first showed Trey the score, he handed me his phone and asked me to take a picture of him showing it off to post on Instagram. 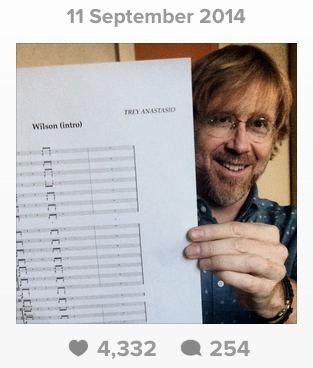 One of the fun projects I did music prep for last year was Trey Anastasio’s symphony tour, working with Nashville orchestrator Don Hart. Trey performed in Portland with the Oregon Symphony on a Tuesday night, the Seattle Symphony on Thursday, and then closed out the L.A. Philharmonic’s summer concert series at the Hollywood Bowl two weeks later. At the end of Trey’s first rehearsal with the Seattle Symphony the day before the show, he told me the story of how the intro to the Phish song Wilson came to be played for the Seattle Seahawks quarterback Russell Wilson when he walks into the stadium, and asked if I could write it out for the orchestra so he could include it in the encore. So while drinking my coffee the next morning, I looked up a couple videos to see how it went, created the orchestral parts, and passed it out at the rehearsal. And then this happened.